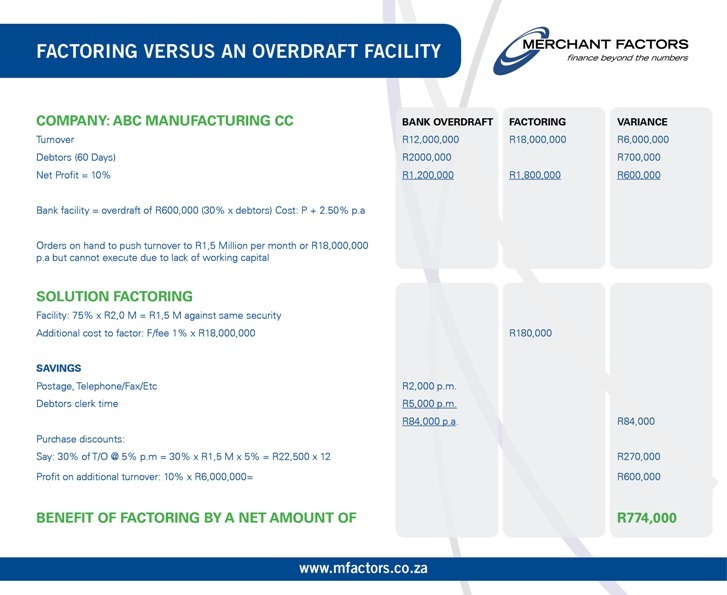 In comparing a factoring facility to an overdraft there are similarities but also differences because; While both provide finance at a determined interest rate, factoring charges a factoring fee as well which covers the provision of the administrative service (sending out statements, allocating payments, checking that quality and deliveries are in accordance with the orders placed, etc.) but, more importantly, factoring provides a much higher level of funding which can be used to secure discounts from suppliers for early settlement, increase turnover on which additional trading profit can be earned, avoid having to give away discounts to debtors for early settlement, etc. all of which add to the bottom line.